Admit it. Sometimes, your Twitter life is messy. You follow hundreds of people — maybe thousands. Staring at your timeline is about as intelligible as reading a stock ticker. How do you bring organization to your Twitter life? How do you rise above the confusion, cut through the complexity, and become a superstar on Twitter? 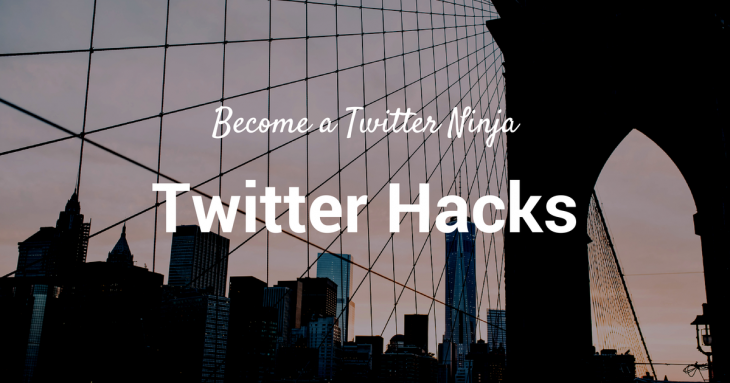 You learn these 15 Twitter hacks. 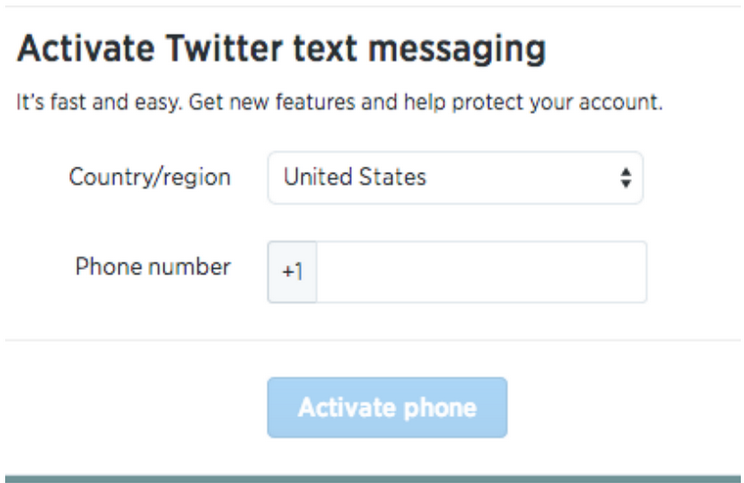 Once you pick up on these power user features, you’ll become a Twitter ninja in no time. Want to turn your Twitter feed into a streamlined and swift way of accessing only the information you want? This hack is for you. Type in a name for your list and a brief description. Set the privacy settings, save the list, and you’re done. 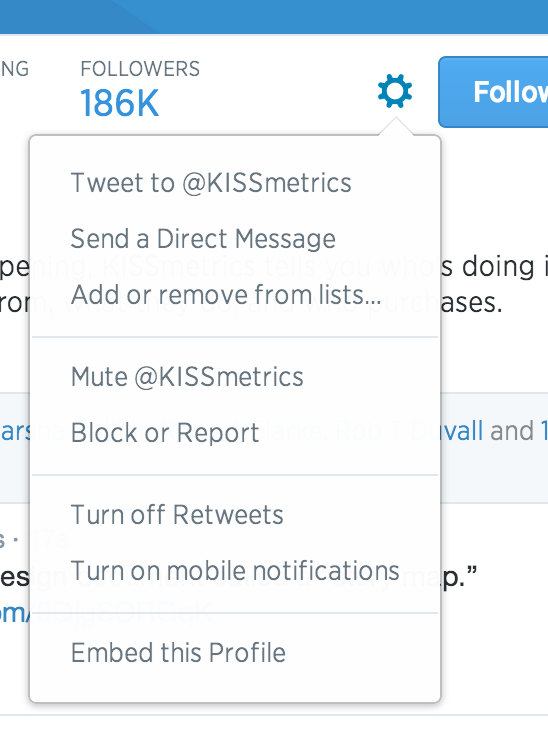 Add Twitter users to your list by clicking on the gear icon next to the Follow button on any user’s account. 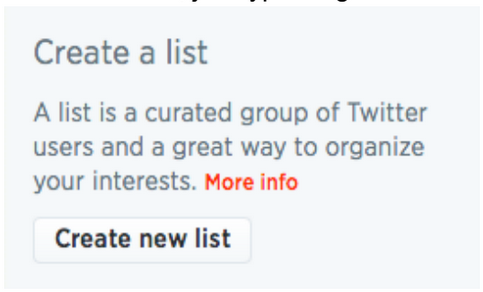 You don’t have to be following the user to add them to a list. 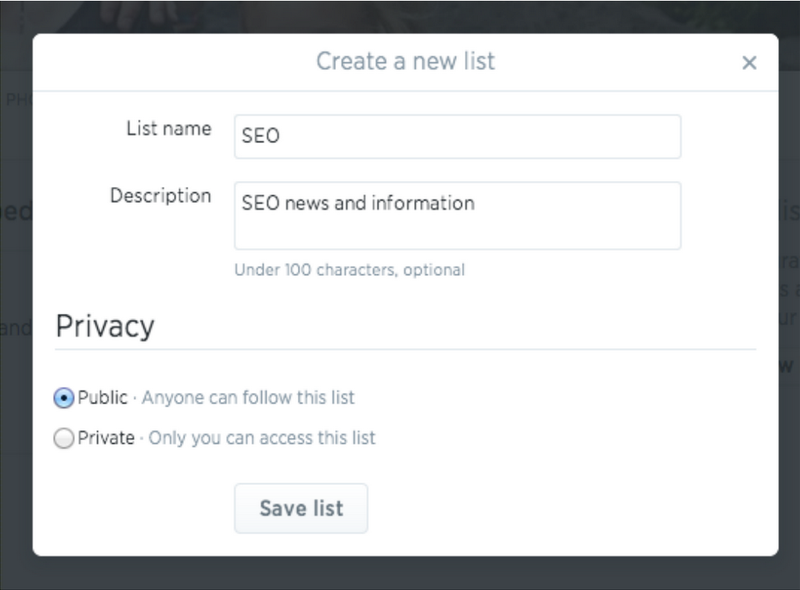 Choose “Add or remove from lists…” and check the list you want. Done! Knowing what lists you’re on gives you an idea of how you’re perceived on Twitter. Are you in a lot of “SEO” lists or “digital marketer” lists? The more you use hashtags, the more engagement you’ll get on your tweets. Tweets with hashtags are proven to double engagement rate, grow more followers, improve reputation, and gain information. Check out my infographic on the power of hashtags. The best tweet times are on weekdays between 9am and 3pm EST. Forget Friday. Twitter’s search bar looks humble and unassuming, yet it possesses an incredible amount of power. You can unleash this power using Search Operators. Twitter’s advanced search is just that — advanced. With the exabytes of information being churned out by tweeters every day, there is a ton of great information available for the searching. Advanced Search is the way to find it. If you’re not yet adept at using the amazing buffet of search operators, you can use advanced search to stitch together a precise and targeted search. 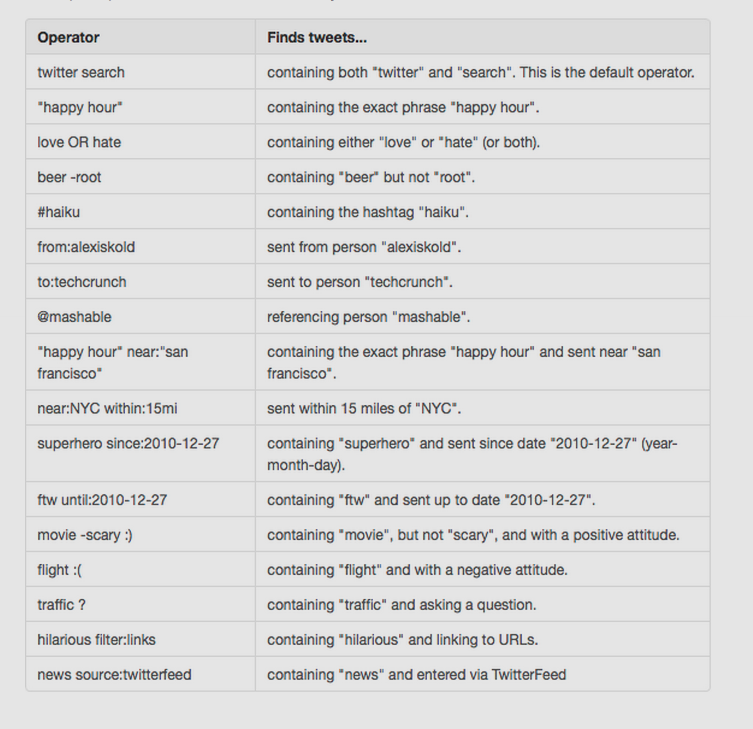 Search for questioning tweets – ? I think you’ll agree that’s quite the level of complexity. Let your ninja searches begin. As you integrate your Twitter life with all the other aspects of your online life, there may be tons of apps that have access to your account. If you put hashtags in your bio, people will be able to find you better when they perform searches. Don’t like getting tons of emails from Twitter? Turn them all off with a single click. Go to your profile, then email notifications. Look for the “turn off” button at the top. You love Twitter. You’ll love texting using Twitter. Just go to your mobile tab, and turn on Twitter text messaging. If you are an inveterate tweeter and losing precious shut-eye because of your addiction, it’s time to impose some limits. Click on “mobile.” Assuming you’ve added your phone, select the times that you ought to be sleeping, and keep twitter shushed up through the night. Are you into personal improvement, life tracking, and writing your own bio? Twitter has a hack for that. 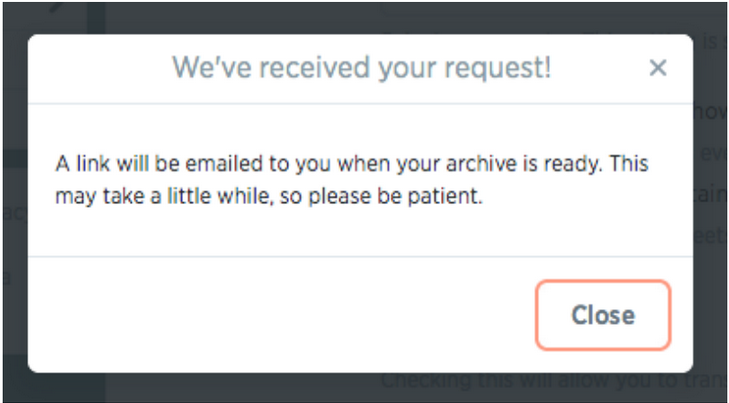 Click the gear icon, then “Settings.” Go to the bottom and click “Request your archive.” You’ll get an email when it’s ready. Gets you exposure, especially if you’re wanting more visibility by the radar of list owners and participants. Hint: You can follow a user’s public list without even following that user. The Twitter algorithm is sick. If you haven’t tried out #Discover, you need to do it now. Clicking #Discover gives you an algorithmically-curated list of tweets that you should see, but that don’t appear in your ordinary feed. Based on follows, mentions, interactions, favorites, and retweets, #Discover gives you a list of the best of Twitter at that very moment. It’s almost like it reads your mind. Type ? 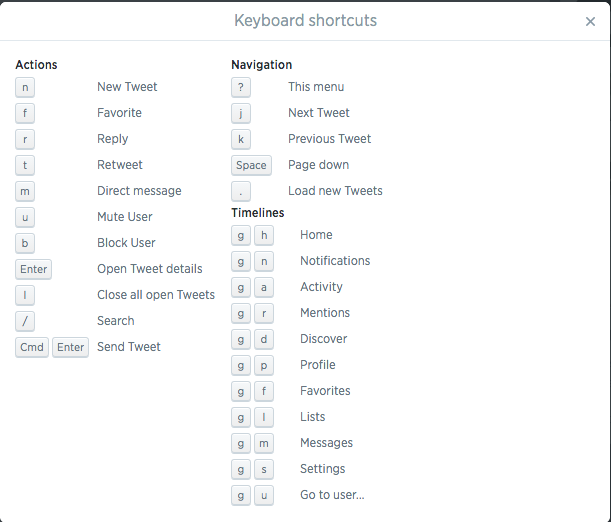 in Twitter, and view all the most important keyboard shortcuts. Here’s what you’ll see. Learning Twitter is like anything else in life. The more you use it, and the more you learn, the better you’ll get. These hacks will help get you there faster. What other expert Twitter tips can you share?